"Albert Chepkurui, who was one of the big guys then, said, 'Ricky, you wanna see this guy; he was running with us today, we were going fast and he was able to stay with us for 40 minutes. But he had no shoes on, he was running in trousers.' And I was like, 'Whoa, that's pretty good.'" 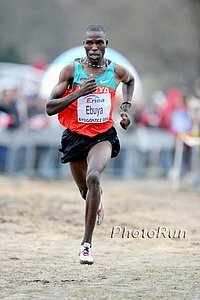 - Just the tip of the iceberg of the incredible story of Joseph Ebuya, the man who did the Kenyan equivalent of scoring the winning touchdown in the Super Bowl when he won World Cross-Country this week. Ebuya's manager and coach Ricky Simms and coach Noah Ngeny (yes, the 2000 Olympic champion and 2:11.96 1000m WR holder) were generous enough to join us for an hour-long Training Talk on Thursday. Joseph Ebuya's story is truly remarkable - from a nomadic existence in Turkana, to signing a Nike contract when he didn't even know what the clock on the track meant, to Kenya's greatest sporting hero - read or listen to the entire story of an inspiring figure. LRC Photos From World Cross Country 2010 Photos of the Americans jumping the logs on the course in Poland. BBC Sports Statistician Mark Butler Wonders What Is Behind Europe's XC Decline He credits Kenyan "organization, management and coaching" for the shift. *Wilfred Bungei Says Kenyan Defections Will Kill Athletics If Kenyans keep defecting, Bungei says, there will be 12 Kenyan-borns in every distance final at the major events. 3 Kenyan males who didn't even make their team have run 27:22 or faster on the roads this year. NY Times: Tiger Woods And Caster Semenya Making Comebacks Like We've Never Seen Before Most LetsRun visitors think Semenya should compete as a male (see poll, right). Sergey Bubka Will Head IAAF Commission Intent On Studying Athletes And Their Entourage Proponents of the amateur days of track and field, have fun with this one. *Recommended Read: Ryan Hall Chats With Runner's World - Can He Win Boston In Try #2? From the sound of things, Hall has done everything right, though fans squirm at his only pre-marathon race where he got crushed by Simon Bairu in a half marathon. *Meb K Talks To Running Times, Hopeful For American 1-2 Meb has the 16th-best PR in the strong field. World XC Champ Emily Chebet To Race Meseret Defar At Carlsbad 5k On April 11 Race organizers deserve major credit for getting this matchup, though Defar (with a track 14:12 and road 14:46) has to still be a big favorite. Marathoner Arata Fujiwara Quits Team In Unprecedented Move For Japanese Elite JRN's Brett Larner's take: This is big news. As far as we are aware, Fujiwara is the first Japanese man ever to make this kind of move at the peak of his marathoning career. *Martin Mathathi Plans Half Marathon And Marathon Debuts After Outstanding 10k Success Mathathi's manager talks about his latest road 10km in a video to the right. Recommended Read: Kids, Read About Dave Wottle And How Track Used To Be Münich 800m champion Dave Wottle gives a long and interesting interview with Gary Cohen. Outside of running, he talks about water skiing naked with Steve Prefontaine. *Usain Bolt Commits To 10-Year Partnership Of Supporting His Local Hospital It's good to see not all the money is going to fast cars and the local nightclubs. Judging from the texts, emails, posts, people upset with Obama, people wanting Obama to sue us for slander, a lot of viewers fell for our 2010 April Fools homepage. While our April Fools page was pretty good, the best April Fools Prank was on the Boston Marathon. A LetsRun.com fan planned his prank weeks in advance as he created a fake a website mybaa.org (that looked nearly identical to the real Boston website) and said the Boston Marathon qualifying times changed 10 minutes for each age group. He then posted on LetsRun that the times changed and soon the news spread. People were up in arms and apparently the people at the Boston Marathon can't take a joke as they wasted who knows how much money having their lawyers send a letter threatening the guy. All we can say is excellent job.